Welp! Here we are again. 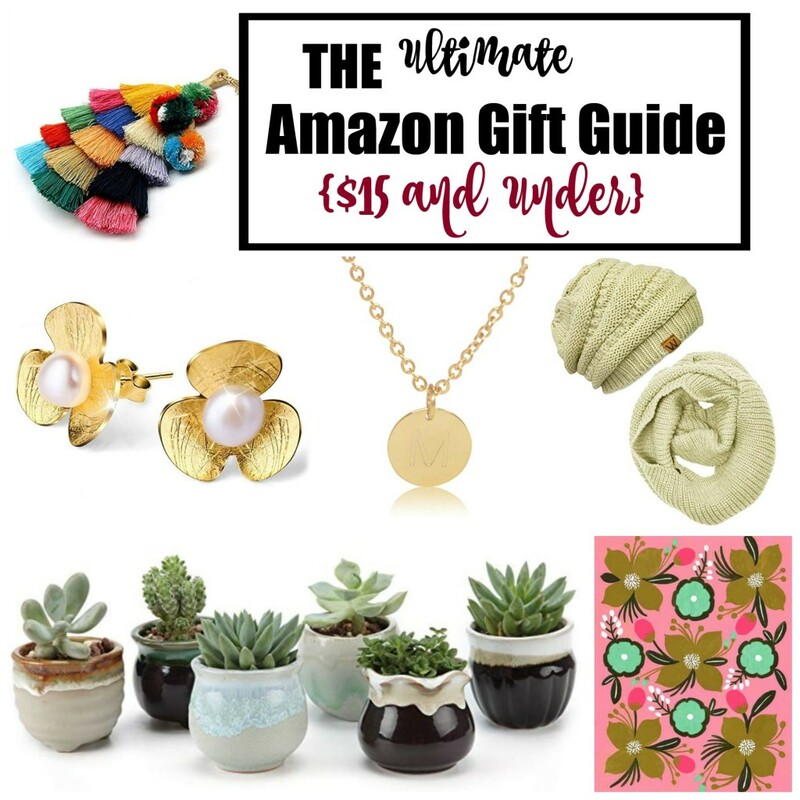 The most wonderful time of the year with the most wonderful Amazon Gift Guide around. Kidding. Sort of. But seriously, folks. I get kind of carried away finding the coolest stuff for the best price + reviews for you guys, so I certainly hope that you will find something you need/love for your people (or, ahem, yourself). I’m not sure that an under $15 gift guide is complete without a candle option. Now, I’ll be the first to admit that I choose my candles based on three things, in this order: 1. Price 2. Looks (because half the time I forget to light them), and 3. Scent. I haven’t personally smelled this La Jolie Muse White Tea Scented candle, but it sure is purdy AND full-sized, which means plenty of burn time. Assuming you like the scent, of course. I’m all about buying packs of things I can split up and then add to gifts to fill them out. These adorably packaged soaps have great reviews and would be awesome as a stocking stuffer or the perfect finish to a teacher gift. Imma ’bout to bombard you with 3 Burt’s Bees products in a row and not because I work for them or anything. I just like that their products are generally very clean (free of unnecessary dyes, parabens, sulphurs, etc.) and yummy-smelling/effective to boot! This cute little set would work well as a standalone gift or split up among girlfriends. I love my Burt’s Bees lip balm. Ever since having Ezra, I have notoriously dry lips, especially in the winter, and I’m a fan of the moisture factor without the junk. And this one! My hands are suffering from dryness at the moment, and I kind of want to take a bath in every product that comes in this cutie-pie bag. Have you heard of Jamberry or…well, any of the other copycats? Well, Amazon has got you covered without the hassle of finding a consultant with these cute nail wraps. Not saying I’d be over the moon about the Hello Kitty options, but my girls would, which may just mean that I buy some for me and then put a few in their stockings. This is another great option for splitting up between friends. Got a paper/pen/pencil/organizer lover in your life? Then these next few options are for her! I love the minimalist-while-still-girly option of this laser-cut floral organizer set. Super cute and functional (albeit small…this would be best for a space-saving desk). WHY do floral pencils make me so happy? No clue. But they do. And if you or anyone you know feels the same way, well..here. you. go. And what better to carry your floral pencils in than a floral! pencil! bag! (No answer necessary). It wouldn’t be one of my gift guides without Rifle Paper Co. product. This stationery set is adorable! As are these cute floral notebooks (although not Rifle Paper). I’ve been wanting to learn hand-lettering/quasi-calligraphy for a while, so I bought this set to go with a hand-lettering book (more on that in another gift guide installment), and I’ve been having so much fun doodling. Would be great for a creative in your life! And again with the Rifle Paper Co.! But when it’s this pretty, and it can double as a calendar AND a mouse pad, can you blame me? If that desk organizer wasn’t enough order for your just-so friend, a boatload of pretty organizing files might do the trick! I find that the prettier the tool, the more I want to use it. Apparently, I TOTALLY judge a book by its cover. This next little spate of offerings has a major sparkle factor at a low price tag. My fave! I can absolutely see scoring these gold floral pearl earrings at Anthro. Just not for this price. And this pair is actually an Anthropologie knock-off with great reviews (I own the originals in mint, which I scored on clearance, of course, and they are legit my favorite statement earrings). This leaf necklace is ethereal and floaty looking enough not to be obnoxious while you’re wearing it, but the reviews say it’s still well-made and substantial enough not break after one wear. I have these earrings in hunter green, pink, and mustard…and get compliments on them wherever I go. CanNOT beat the price for a set of three! I don’t actually own this brass cuff, but I love the chunkiness of it and think it would make a great gift for a girl who loves to make a statement without a lot of fuss. I DO own these delicate gold hoops. I am, in fact, currently wearing them in all 4 of my cartilage piercings, and I get numerous compliments on how pretty they are. I love them because they’re barely there, in both look and feel, and the price can’t be beat! I think I’ve recommended a version of this necklace every single year that I’ve done this gift guide. It’s adorable, personal, and oh-so-affordable. I know this jazzy tassel key chain wouldn’t be everybody’s cup of tea, but it sure is cute! And cheap (I’ve seen designer versions for 3-4 times as much). Lots of other great color options/combos too! The wear-something-in-your-hair trend comes and goes, but it’s definitely here at the moment, and these head wraps are stylish, well-reviewed, affordable, and come in multi- packs so you can split them up! And what would a gift guide be without a cozy set of socks? These have great patterns (lots more options when you click through) and great reviews. It’s hard to beat the comfort of a chunky scarf + beanie. Especially at this price. Lots more color options! Big plaid scarves, y’all. Apparently, they are here to stay. This is the 3rd or 4th year I’ve featured one, and I think this one is pretty darn cute. If these colors aren’t your thing, though, there are plenty more to choose from. Also, neckerchiefs. Not just for ladies-who-lunch, apparently. I don’t honestly know if I could pull these off, but I think they would be adorable as a head scarf or wrapped around a ponytail. I own this workout tank and get a lot of comments/compliments on it. And, while it’s not really true that I’m such a fan of donuts (I’m not averse, but my sugar vices lie elsewhere), I love the chuckle-factor + comfort level. Plus it’s LONG! (Runs a bit large, in my opinion). And now, for the cooks in our lives. Because if you’re going to use it, it might as well be pretty as well as functional, right? Like these pink + rose gold untensils. Lots of other color options! Good reviews but they do tend toward the smaller side. Second verse, same as the first! (Only these don’t run small. That would be weird). Oddly enough, I didn’t find tons of mugs I loved on Amazon in the under $15 range. But this pretty gold + white + peppy saying caught my eye. (More options when you click through). These are a shameless Anthro knock-off. I have the Anthro version (on sale, natch), and I love the cuteness factor as well as the practicality for small servings of sauces, nuts, snacks, etc. This is a stylish fruit basket you could happily leave out on your counter, and I think the price is fabulous for the size! Same for this spoon rest. Simple. Classy. Functional. Oh, and this is just cute! Because who doesn’t love a good floral tea towel?? These pom pom baskets have gotten rather ubiquitous, but I, for one, am glad. They’re FUN-ctional (see what I did there? ), and this one is really affordable without being too tiny to actually hold anything. I’ve wanted one of these clear umbrellas for a while. I love the simplicity/retro shape of the design. Plus, they just scream whimsy to me. But I always assumed they were expensive (not sure why). Happy to be wrong! And I just love the sleek, minimalist design of this white version. So, there you have it, friends! Affordable gifts for a VARIETY of friends, family, coworkers, besties, and beyond. I’ll be back very soon with our next price bracket PLUS a guide for guys, kids, AND books! Phew! As always, be sure to browse guides from years past. Lots of great suggestions still available at similar prices to the ones I listed then. I always look forward to your gift guides. Thank you! I’ve been anticipating these posts! So weird! I wrote a long comment and it only posted the first sentence. Love the tassel earrings! Love the head wraps! They remind me of the one you sent me before I had my first child. Sweet memories!